Learn about primary colors with characters from PBS shows! Today’s colors are red, yellow, and blue. The primary colors! Try a color mixing activity! Lots of ideas can be found here. Red is a primary color. 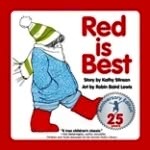 Read Red is Best by Kathy Stinson.